Burton Pidsea-based rally driver Becky Kirvan will return to the forests for her next KC Rally Team event when she contests the Trackrod Challenge event. The last two BRC Challenge championship rounds have been held on the tarmac roads of the Scottish Borders and Ulster respectively but the Trackrod will use gravel tracks in the forests of Yorkshire. "I’ve not competed in the forest since the Pirelli rally in April but I’m confident that I will quickly get back into driving on gravel," said Becky. "I enjoyed the tarmac events and I was very pleased with the results we got but I prefer the rallying in the forest so I’m really looking forward to the Trackrod Challenge rally." Becky will compete in her usual KC, Bardahl Oils, Princes Quay Shopping Centre, Rally4Real, Peart Auto Services and Songasport-backed Ford Fiesta ST. 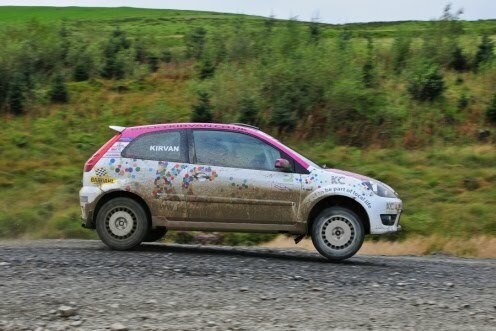 Although she has not competed since Ulster it has been a busy time for Becky and the KC Rally Team. "We’ve been doing a lot of promotional work with the car including appearing at the KC Rally Day at Sweet Lamb in Wales as well as filming a feature for the BBC. It’s all been great fun and it’s really added to my rally season." "The Trackrod is my local event so I am especially keen to get a good result although it will be the first time I have competed in the Yorkshire forests. We’re presently in second place in the RC5 class championship so I am hoping to maintain that position." The Trackrod Challenge rally will start in Scarborough on 24 September with the crews battling over 50 miles of stages in the forests around Pickering. Please visit www.beckykirvan.co.uk or join the Facebook group at www.facebook.com/BeckyKirvanRallying.